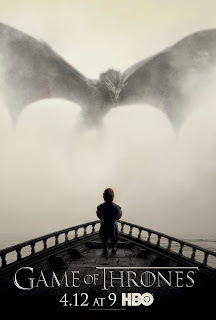 I closed last week's review of the excellent The Dance of Dragons by confirming my faith in the Game of Thrones writers, and stating that I had no doubts that they would succeed in delivering a stellar finale despite the barrage of plot threads still waiting to be resolved. Episodes eight and nine were always going to be tough acts to follow, and Mother's Mercy does struggle slightly in giving each story a satisfying close, but for the most part my faith in the writers did not go to waste. This was an unusual finale for a number reasons, particularly if we compare this episode to the previous season's final outing, The Children. Both episodes take different approaches to the "finale" concept; whereas The Children resolved each story and set the characters onto new ones, Mother's Mercy presents us with cliffhangers that keep everyone pretty much where they were. And, for the most part, this works as an interesting way of delivering a season's final episode, I jut can't help but wish each character or location got a bit more screen time than they did. I attribute a lot of this fault to episodes eight and nine. Whilst both are stellar episodes, ranking in my books as the best of the season, they both succumbed to final acts of an enormous scale, increasing the amount of screen time in both Hardhome and Meereen. If I had to put it roughly, I'd say Hardhome itself stole thirty minutes of screen time, with Daznak's pit filling around twenty minutes of episode nine. Whilst both sequences did require that vast amount of time to tell their stories, it's unfortunately forced a more than comfortable amount of plot to be crammed into episode ten. Throughout Mother's Mercy we check in with Stannis, Ramsey, Sansa, Arya, Jaime, Tyrion/Varys/Jorah, Daenerys, Cersei and Jon. And it all just felt a bit much. The first two acts of the episode consist of a repeated structure of beginning-middle-cliffhanger, with each story granted less than ten minutes of screen time. Constantly cutting from location to location to location gave Mother's Mercy a consistently jarring tone throughout, just as things started to get interesting, we cut away and won't return now +for another ten months. 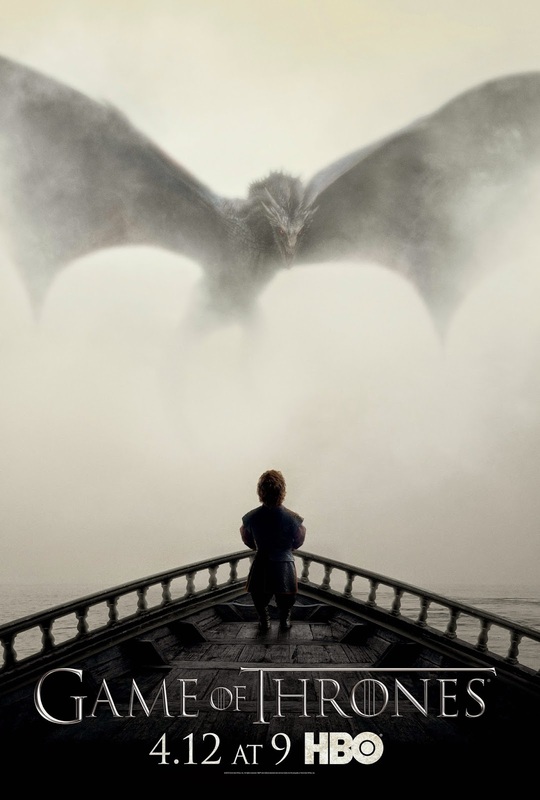 But the beauty of Game of Thrones is that it can sustain that. 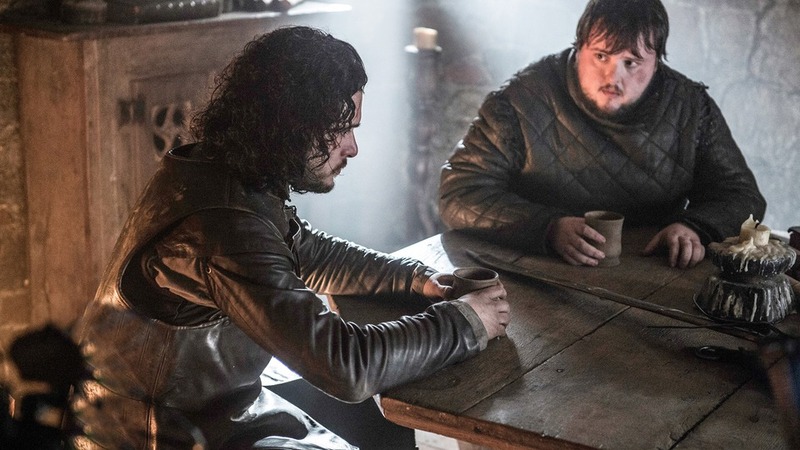 There are some huge cliffhangers at play here, especially that of the fate of Jon Snow, a death that rivals the execution of Ned Stark back in season one's Baelor for sheer shock value. Much like Ned Stark's execution, Jon's death had been looming for a while now. Whilst he appeared to be one of only few characters left audiences were willing to root for, Jon repeatedly placed the bigger picture over the morality and comfort of the men who elected him to lead them. The reveal of the 'traitor' sign as opposed to a Wildling who had seen Benjen Stark was a heart stopping moment, followed by Jon being stabbed repeatedly, which we are forced to see each time. That Olly should deal the final blow only twists that agonizing knife even more. This has been a consistently dark season, so it's only fitting that the series' final shot should have a well-loved character lying lifeless on the floor, as his dark blood begins filling the frame and overcoming the lightness of the snow surrounding him. But will Jon Snow remain dead for long? This is a question that begs to be answered; whereas the story was visibly able to continue moving after Ned Stark's death, I can't see events at the Wall remaining interesting without Jon. And the timing of Melisandre arriving that night can't mean nothing, can it? Jon's story, thankfully, manages to escape the beginning-middle-cliffhanger structure that plagues a lot of tonight's episode, but other stories don't fare entirely well. Whilst each strand moves at an admirable pace and the show never succumbs to anything actively bad, it all just felt a tad rushed. 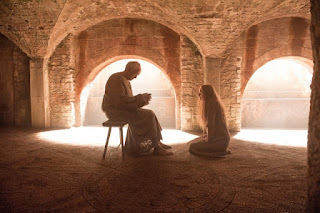 For example, Myrcella's poisoning played directly after her reveal that she knows and appreciates Jaime as her father felt far too formulaic, much like Sansa placing the candle in the window mere seconds after Brienne abandons her post for the first time. These sorts of unfortunately timed coincidences work well for dramatic effect, Myrcella's poisoning was a genuinely shocking moment, but just feel a tad too poorly timed to stick within the realms of probability. Had more time been allocated to each individual plot, these bad coincidences could have been avoided in favour of something more grounded and more believable. Mother's Mercy also offers a flew blotched scripting moments too; the Sand Snakes are fully confirmed as a lost cause now, entirely reaffirmed by Tyrene's laughably ridiculous final words to Bronn. The Tyrion line of "My Valerian is a bit nostril", used to demonstrate his lack of knowledge of the language, was also played for comedic effect and fell entirely flat. The strongest moment of the fifth season's finale came in it's titular story; Cersei. Her walk of penance is a moment that the show has been building to for a long time now, and whilst it wasn't played out in the way I thought it would be, it was a powerfully emotional sequence that demonstrates just how fantastic Lena Headey is as an actress. Her naked walk from the Sept of Baelor to the Red Keep used a variety of frames; we had wide shots to demonstrate the scale of those who turned out to watch and berate her, there were close ups of Cersei's face to show her slowly and steadily breaking, and also POV shots to place the viewer firmly inside her frame of mind. 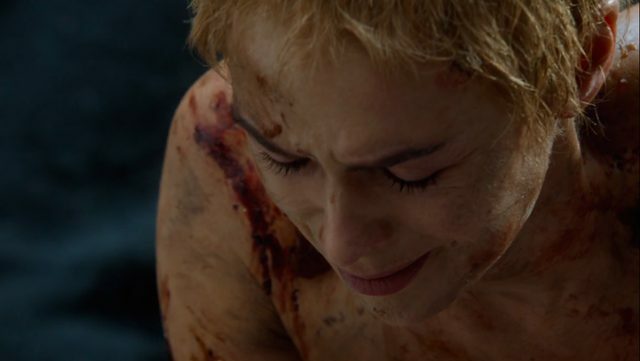 Director David Nutter did a stunning job of taking Cersei's character through a range of emotions, enabled fully by Headey's laudable performance here; it would not be a surprise to see her collecting an Emmy later this year for this sequence along. But compare the images, taken directly from the episode, that I've placed before and after these paragraphs. Nutter succeeded entirely in using light, colour and framing to represent Cersei's slow breakdown throughout her walk, despite her best efforts not to show it. In a season packed with memorable sequences, this is one of the hardest to forget. This sequence represents Cersei as a character more than any other this show has done in a long time, perhaps the most intricately written and paced since her conversation with Robert about their marriage way back in season one's excellent The Wolf and the Lion. Alongside Jon Snow's, this is the one other story that didn't feel cut short or jammed in. We see Cersei in four environments throughout her sequence; the cell, the Sept, the streets, the Red Keep. 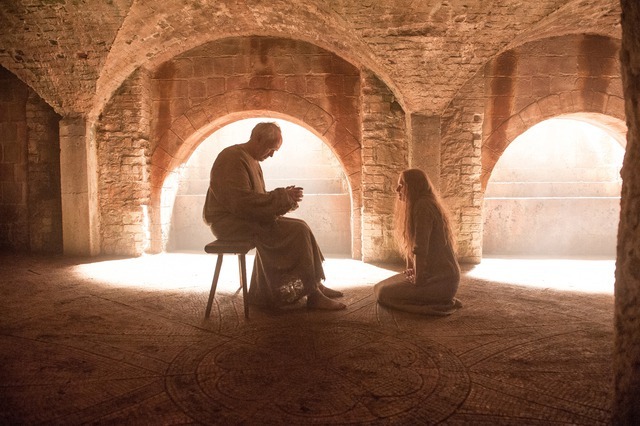 She begins broken, cowering in the corner of her cell in the dark, before we immediately cut to a brightened room, in which Cersei finally appears to be offered hope for the first time since her arrest. But we then cut back to the cell again, as she is stripped and shaved in preparation for her walk of penance. Any hope Cersei felt, or any hope the audience felt for Cersei, is demolished by that one cut, immediately setting this up as a deeply unpleasant scene. But Headey takes on this task phenomenally well, giving a series-best performance, taking Cersei through the widest range of emotions, and using only her face to do so, without a word of dialogue. By the time she reaches the Red Keep, we see her bloodied feet and dirtied body, but it's the broken expression on her face that hits hardest. Game of Thrones' fifth season has been a divisive one, but undeniably one that improved in its final stretch. Whilst the fault also lies with episodes such as the (forgivably) uneventful nature of The Wars to Come and the (unforgivably) underwhelming feel of Kill the Boy, Mother's Mercy just wound up with a bit too much to do and not enough time to do it in. But once we look past the jarring pace and structure of the finale, it was an episode about hope, or the losing of hope. While Sansa and Theon (who has broken away from his Reek identity now) jump from the towers of Winterfell with their first glimpse of hope all season, Arya is punished for completing a task she's desired since season one. While Brienne finally has the chance to seek vengeance on a man she has always sworn she would, Jon was betrayed and murdered by his own men. Mother's Mercy is a stunning reminder of how well told the stories of Game of Thrones are, even with the pacing difficulties each story developed well while remaining strengthened by the united theme. Season five may not have been the show's strongest year, but it is the most thematically rich and visually beautiful season the show has offered us yet. It leaves an awful lot in the air for the ten months we now must wait for whatever is in store for season six, but with a show this good, I'd wait ten years to see where they will take us next.